Eric's House - Where our beds and TV is. Where our beds and TV is. Home Cookin Sereval years ago some friends and I put together a humorous cooking video based on what happens if you put a compact disc into a microwave. You can see the video, along with part two of the story. The Furborg One of the projects I did several years ago required me to control devices such as TVs, VCRs and cable set-top boxes with a computer. I created a little infra-red transmitter that was controlled with RS-232. Once I could could handle various TVs and things, I decided to see if it could talk to my son's furby. Just like any other personal web page, this one probably doesn't have a lot to offer the average netizen. Maybe someday it will, but for now it just gives me something to do. 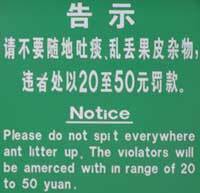 The "Do not spit everywhere" picture is a picture that I took of a sign on Shaiman Island in Guangzhou, Guangdong, China. While in China in January of 2006, I saw many signs like this that had interesting English grammar and spelling. In 2006, 50 Yuan was worth about $6.25 in USD. Copyright © Eric Schultz 2010 - All rights reserved - You break it, you bought it.